A key feature of the recent financial crisis (2007-2008) has been the interconnectedness between banks and sovereigns (see Altavilla et al. 2016 and Li and Zinna, 2014). This crisis has shown two directions of transmission. On the one hand, in some countries it has been originated in banks and transmitted to the governments, i.e. the Irish style crisis. On the other hand, sovereign public finances have dampened the banks’ balance sheets inducing bank fragility, i.e. the Greek style crisis. Importantly, the crisis has cast doubts on the solvency of European banks which were exposed to mark-to-market losses and impairments on peripheral (Greece, Ireland, Italy, Portugal, and Spain) sovereign bonds (Acharya and Steffen, 2015; Acharya et al., 2014). The effects of this risk towards and the consequences of possible bailouts on credit supply and real investment have been present in the foremost financial literature (e.g. Correa et al., 2012b). Acharya et al., (2014) examines whether the financial sector bailouts were igniting the rise of sovereign credit risk in developed economies and showed that governments face a trade-off between bailouts and credit availability to the private sector. Several authors have demonstrated that government support, in several manners, implies introducing ex ante moral hazard cost at the bank level, thus inducing risk-taking behaviour to the overall banking sector (Acharya et al., 2016, Berger et al., 2016, Dam and Koetter 2012; Giannetti and Simonov 2013, among others). One of the important externalities created during the European sovereign debt crisis in 2011 was the freezing of the interbank markets and the subsequent market fragmentation, with banks in core European countries unwilling to lend to their peripheral counterparts. Betz et al. (2016) show that bank interconnections, i.e. density, varied with the intensity of the crisis. Paltalidis et al. (2015) find that the sovereign credit risk channel amplifies the contagion effect through the European banking system. The variation between northern and southern banks in terms of their response to systemic risk were more pronounced for the formers. Another broad insight is that financial institutions may create complementarity between public and private finance. Although there is strong evidence that the risk of defaulting is low in developed economies (see Reinhart and Rogoff, 2008, 2009, 2010), the mechanisms and consequences on credit supply and the real sector are still under debate. Uncertainty over possible government defaults is found to reduce bank lending provision, in particular, in countries where bank exposures to sovereign bond are stronger (Gennaioli et al., 2014). Indeed, higher leverage allows banks to increase their level of investment but it also magnifies the effects of shocks in their balance sheets. Thus, possible government defaults and bank holdings of sovereign debt may reduce the supply of credit and exacerbate the disruption in real activity, particularly relevant for agents involved with more leveraged banks (Correa, 2012a). Government debt securities receive a preferential treatment in the Basel requirements (see the Institution article of this Issue). The view that government bonds are risk free may increase the appetite for this sort of assets. In particular, liquidity and capital requirements may encourage banks to acquire sovereign bonds. Farhi and Tirole (2015) advocate that banks might strategically take domestic sovereign risk in order to condition governments to refrain from actions that may lead to default, opening up strategic interactions between banks and governments. This bank’s behaviour may have a twofold repercussion on the public sector: (i) disciplining implicitly the sovereign, and (ii) favouring public support, i.e. a bailout.1)Similarly, Acharya and Steffen (2015) and Acharya et al. (2016) also identify risk-shifting and regulatory arbitrage as one of the transmission channel of the sovereign crisis to the banking sector. In particular, regulatory arbitrage which assign zero risk-weighted assets for in investment in sovereign debt allow banks to continue to borrows. Furthermore, banks may also practice risk-shifting as a survival strategy. Likewise, “vertical” discriminations are being proposed (Brunnermeier et al., 2011 and 2016, Corsetti et al. 2015 and Altavilla et al., 2016) as possible alternatives to consider some extent of risk derived of the holdings of sovereign debt.2)See the ‘Editorial’ section. In particular, these proposals consider the creation of the European Safe Bonds (ESBies) at the European level, as discussed in the Editorial and the article by Marco Pagano in this issue. The foremost financial literature has focused on the so called “carry-trade” behaviour of banks to explain the risk assumed by banks between 2007 and 2013. On the upside, the bank can pocket the “carry” when the spread between long-term peripheral sovereign bonds and bank’s short-term cost. 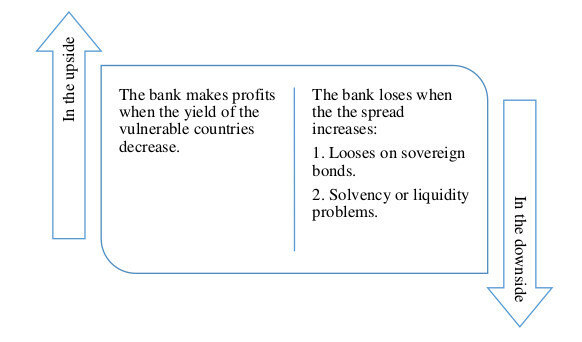 On the downside, the spreads between both legs of the trade diverge, resulting in significant losses for the bank leading to concerns about liquidity and solvency (Acharya and Steffen, 2015). See Diagram 1. Indeed, this carry & trade may be viewed as a bet for the survival of the Eurozone. Indeed, the high and significant correlations between the bond yields of Germany and France, and those of the peripheral countries, demonstrates that markets were more reluctant to finance banks’ investment in risky sovereign debt. This provoked a flight into long-term core countries sovereign bonds. Acharya and Steffen (2105) present empirical evidence that European banks have used the carry & trade to obtain profits. A further distinct feature is the home bias hypothesis according to which banks particularly increase their exposure to their home country. Battistini et al. (2013, 2014) supported this hypothesis showing that in the Eurozone periphery banks indeed showed a home bias by disproportionally increasing exposure to national sovereign risk.3) The premise behind this observation is that a “moral suasion” mechanism operates in peripheral countries that forces domestic banks to absorb more of their own sovereign debt because of a weak demand and to reduce sovereign bond yields (Acharya and Steffen, 2015). De Marco and Macchiavelli (2015) show that government-owned banks or banks with politicians in the board of directors display higher home bias in sovereign debt compared to privately-owned banks throughout the 2010-2013 period and also that only government-owned banks increased the home bias during the sovereign crisis (moral suasion). Domestic banks may also act as “buyers of last resort”, thus reducing fiscal stress by stabilizing yields and spreads (Ongena et al., 2016). Consequently, Eurozone banks have responded to greater systemic risk by increasing home bias again and it contributed to the segmentation of the European sovereign bond market (see Blundell-Wignan and Slovik, 2010, 2011).3)Giannetti and Simonov (2013) show that the collapse in the loan market may be in part explained by a flight home effect. This effect is motivated by previous negative shocks to investors’ net wealth, which make banks to prefer domestic risk. Investors’ risk aversion, the probability of bailout and lower expected return from diversifications are found to be associated with low appetite for foreign loans. In the vulnerable countries, publicly owned banks, those which were previously bailed out, and the less capitalized banks were more affected by moral suasion (Altavilla et al., 2016). Importantly, the consequences of the differentials with the 10-years BTP-Bund spreads raised the cost of funding and were transmitted to the real sector depending on the characteristics of the bank’s balance sheet with which each firm or household operates (Albertazzi et al., 2014; Delatte et al., 2016). Other authors advocate that the carry & trade is closely related to banks’ level of capitalization. The tendency of undercapitalized banks, mainly located in the peripheral countries, was to bet for resurrection by engaging high-yield sovereign bonds (Battistini et al., 2014). This hypothesis has been also supported by Drechsler et al. (2013) who find that weakly-capitalized banks use lender of last resort financing to invest in risky assets, those whose downside is correlated to bank’s owns default. They do find that this use of lender of last resort is highly correlated to investment in distressed sovereign-debt. Drechsler et al. (2013) also suggest that central banks should address risk shifting incentives when providing further liquidity. For a sample on German banks Buch et al. (2016) show that banks which are less capitalized and more dependent on external markets invest more in sovereign debt than the others. Indeed, banks choose the composition of their portfolio based on risk models and forecast. German banks reduced their exposition insofar as the bond-yield of peripheral countries were increasing.4)Savings Banks and credit unions in Germany did not have a significant exposure to the Eurozone debt crisis (see Buch et al., 2016). At the same time, they were showing preference for German sovereign debt, indicating a “flight-to-safety” and to the home market akin. Finally, the consequences of the carry-trade behaviour reflected into the real sector through the bank lending channel (Arteta and Hale, 2008; Correa et al., 2012a; Popov and Van Horen, 2015). Correa et al. (2012a) documents a reduction in lending provision of US branches of the European banks to US dollar funding owing to liquidity shocks provoked by sovereign risk of their countries of origin. As a result, the liquidity shock impacted negatively the corporate investment of the US firms borrowing from them. These results are supported by Ivashina et al. (2015) who find that during the Eurozone sovereign debt crisis dollar lending was reduced by Eurozone banks relative to their euro lending, and their customers had a more difficult time in borrowing. In the context of the European banking system, De Marco (2014) and Popov and van Horen (2015) show that lending to non-financial firms may have been reduced by a carry & trade behaviour by a number of banks which increased their exposure to peripheral sovereign debt. Acharya, V., Steffen, S., (2015). The “greatest” carry trade ever? Understanding eurozone bank risks. Journal of Financial Economics, 115, 215-236. Acharya, V.V., Yorulmazer, T. (2008). Cash-in-the-market pricing and optimal resolution of bank failures. Review of Financial Studies, 21, 2705–2742. Acharya, V., Drechsler, I., Schnabl, P. (2014). A pyrrhic victory? Bank bailouts and sovereign credit risk. Journal of Finance, 69, 2689-2739. Albertazzi, U., Ropele, T., Sene, G., and Signoretti, F.M. (2014). The impact of the sovereign debt crisis on the activity of Italian banks. Journal of Banking and Finance, 46, 387-402. Altavilla, C., Pagano, M., and Simonelli, S. (2016). Bank exposures and sovereign stress transmission. European Systemic Risk Board. Working Paper Series No. 11 / May 2016. Arteta, C., and Hale, G. (2008). Sovereign debt crises and credit to the private sector. Journal of International Economics, 74, 53-69. Battistini, N., Pagano, M., and Simonelli, S. (2013). Systemic risk and home bias in the Euro Area. European Economy – Economic Papers 494. Battistini, N., Pagano, M., and Simonelli, S. (2014). Systemic risk, sovereign yields and bank exposures in the Euro crisis. Economic Policy, 29, 203-251. Berger, A.N., Bouwman, C.H.S., Kick, T., Schaeck, K. (2016). Bank liquidity creation following regulatory interventions and capital support. Journal of Financial Intermediation, 26, 115-141. Betz, F., Hautsch, N., Peltonen, T.A., Schienle, M. (2016). Systemic risk spillovers in the European banking and sovereign network, forthcoming. Blundell-Wignall, A., and Slovik, P. (2011). A market perspective on the European sovereign debt and banking crisis. OECD Journal: Financial Market Trends, 2010 (2). Blundell-Wignall, A., and Slovik, P. (2010). The EU stress test and sovereign debt exposures. OECD Working Papers on Finance, Insurance, and Private Pensions, No. 4. Brunnermeier, M. K., Garicano, L., Lane, P., Pagano, M., Reis, R., Santos, T., Thesmar, D., Van Nieuwerburgh, S., and Vayanos, D. (2011), “European Safe Bonds (ESBies),” The Euronomics Group. Brunnermeier, M. K., Garicano, L., Lane, P., Pagano, M., Reis, R., Santos, T., Thesmar, D., Van Nieuwerburgh, S., and Vayanos, D. (2016), “The Sovereign-Bank Diabolic Loop and ESBies,” American Economic Review Papers and Proceedings 106, May 2016. Buch, C., Koetter, M., and Ohls, J. (2016). Banks and sovereign risk: A granular view. Journal of Financial Stability, 25, 1-15. Correa, R. Sapriza, H., and Zlate, A. (2012a). Liquidity shocks, dollar funding costs, and the bank lending channel during the European sovereign crisis. Board of Governors of the Federal Reserve System. International Finance Discussion paper Nº 1059. Correa, R., Lee, K-H., Sapriza, H., and Suarez, G. (2012b). Sovereign credit risk, banks’ government support and bank stock returns around the world. Board of Governors of the Federal Reserve System. International Finance Discussion paper Nº 1069. Corsetti, G., Feld, L., Lane, P., Reichlin, L., Rey, H., Vayanos, D., and di Mauro, B. W. (2015). A new start for the eurozone: Dealing with debt. CEPR report. Dam, L., and Koetter, M. (2012). Bank bailouts and moral hazard: Evidence from Germany. Review of Financial Studies, 25, 2343-2380. De Marco, F. (2014), “Bank Lending and the Sovereign Debt Crisis,” Boston College working paper. De Marco, F. and M.Macchiavelli, (2015), The Political Origin of Home Bias: the Case of Europe, mimeo. Delatte, A.-L., Fouquau, J., Portes, R. (2016). Regime-dependent sovereign risk pricing during the euro crisis. European Systemic Risk Board. Working Paper Series No. 9 / May 2016. Giannetti, M., and Simonov, A. (2013). On the real effects of bank bailouts: Micro evidence from Japan. American Economic Journal: Macroeconomics, 5, 135-167. Gennaioli, N., Martin, A., and Rossi, S. (2014). Sovereign default, domestic banks, and financial institutions. Journal of Finance, 69, 819-866. Ivashina, V., Scharfstein, D.S., and Stein, J.C. (2015). Dollar funding and lending behavior of global banks. Quarterly Journal of Economics, 130, 1241-1281. Li, J., and Zinna, G. (2014). How much of bank credit risk is sovereign risk? Evidence from the Eurozone. Bank of Italy Working Papers Nº 990. Ongena, S., Popov, A., and Van Horen, N. (2016). The invisible hand of the government: “Moral suasion” during the European sovereign debt crisis. DNB Working Paper Nº 505. Paltalidis, N., Gounopoulos, D., Kizys, R., and Koutelidakis, Y. (2015). Transmission channels of systemic risk and contagion in the European financial network. Journal of Banking and Finance 61, supplement 1, S36-S52. Popov, A., and Van Horen, N. (2015). Exporting Sovereign Stress: Evidence from Syndicated Bank Lending during the Euro Area Sovereign Debt Crisis. Review of Finance, 19, 1825-1866. Reinhart, C. M., Rogoff, K. S. (2009). The Aftermath of financial crises. American Economic Review, 99, 466-472. Reinhart, C. M., Rogoff, K. S. (2010). Growth in a time of debt. American Economic Review, 100, 573-578. Visco, I. (2016). “Banks’ Sovereign Exposures and the Feedback Loop Between Banks and Their Sovereigns,” Concluding Remarks presented at the Euro50 Group Conference on The Future of European Government Bonds Markets, 2 May. 1. ↑ Similarly, Acharya and Steffen (2015) and Acharya et al. (2016) also identify risk-shifting and regulatory arbitrage as one of the transmission channel of the sovereign crisis to the banking sector. In particular, regulatory arbitrage which assign zero risk-weighted assets for in investment in sovereign debt allow banks to continue to borrows. Furthermore, banks may also practice risk-shifting as a survival strategy. 2. ↑ See the ‘Editorial’ section. 3. ↑ Giannetti and Simonov (2013) show that the collapse in the loan market may be in part explained by a flight home effect. This effect is motivated by previous negative shocks to investors’ net wealth, which make banks to prefer domestic risk. Investors’ risk aversion, the probability of bailout and lower expected return from diversifications are found to be associated with low appetite for foreign loans. 4. ↑ Savings Banks and credit unions in Germany did not have a significant exposure to the Eurozone debt crisis (see Buch et al., 2016).